First off, I want to say Happy Birthday to my amazing husband, Chris!!! Today's Secret Recipe Club recipe comes from Jamie over at Scattered Thoughts of a Crafty Mom. If you ever find yourself in a rut and need inspiration for crafts or meals, her site is the place to go! She has an incredible amount of tutorials and recipe posts, so it's a ton of fun to scroll through her site and get some ideas for future projects! Since Chris and I were getting ready for our Jamaica trip when I was assigned her blog, I had to force myself to steer clear of some of the carb-loaded recipes and gravitate towards the healthier ones instead. 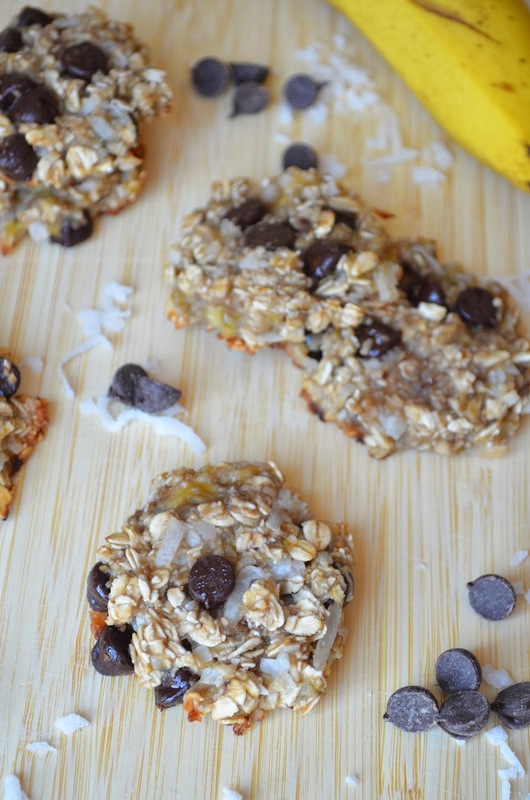 And not only are these healthy, but I only needed two ingredients!! What more could I ask for? 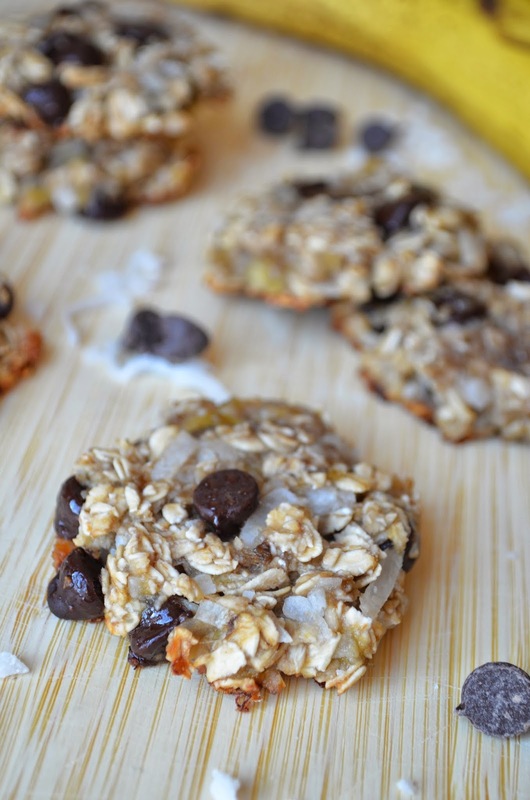 The bananas act as the glue to hold these cookies together, while the oats add some texture and crunch. I opted to add some coconut flakes and chocolate chips because, well, I could. But you could totally leave them out to make them even healthier. These are moist and delicious! If you're craving sweets but want to stay healthy, these are the way to go. These are a great snack for kids, too. Enjoy! Spoon cookie dough onto a very well greased cookie sheet. Flatten out the cookies since they will not spread during the baking process. Bake for 15 to 19 minutes or until the cookies look done. *Adding these mix-ins may make the cookie not gluten-free. I've made these and they are awesome! Great post! Aren't these the best, especially since there is no added butter or sugar? I am so glad you chose this recipe! 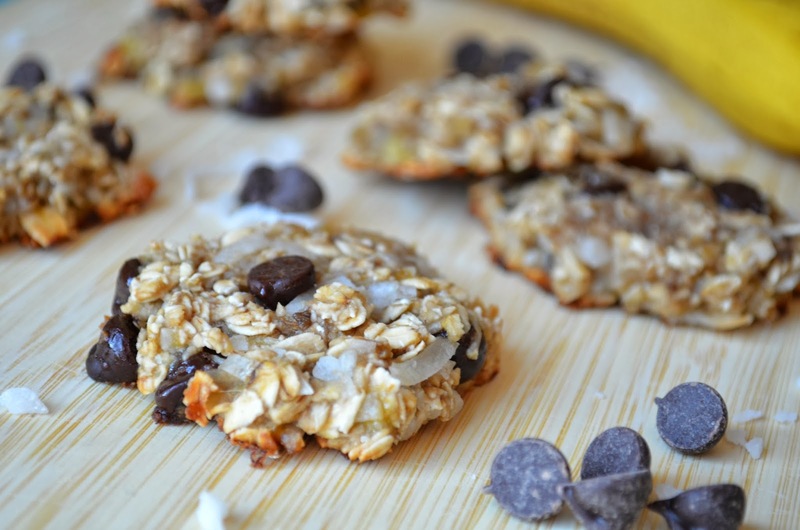 Love that you could enjoy these delights for breakfast or for a snack later in the day. Nice SRC pick! I LOVE the simple ingredient list, I might even let my toddler try these. Okay, instead of making my usual banana bread or muffins with the gazillion frozen naners I think I will make these instead. YUM! These cookies look great- good choice! Oh wow, healthy, yummy and wheat-free. These sound so good, and definitely something the children could help with. I would love if you would share this recipe on Kids and a Mom in the Kitchen as well.